ginger beef | eating with S.O.L.E. This is the real deal my friends. 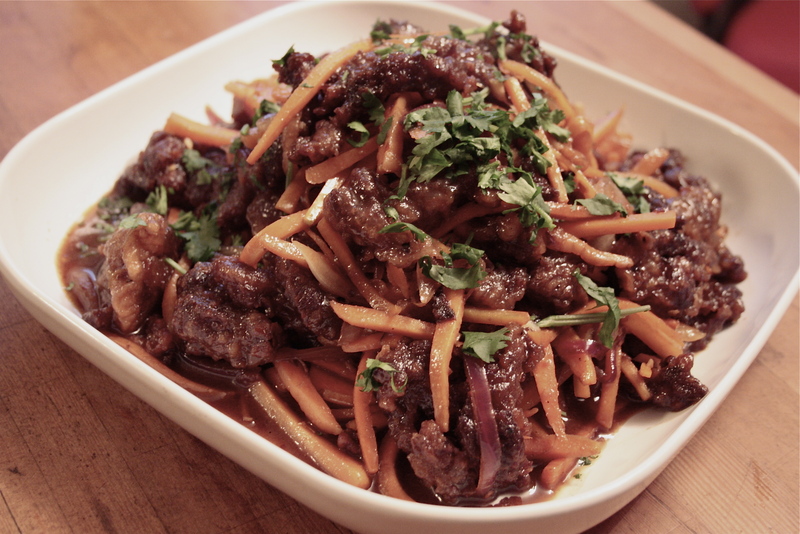 If you are from Calgary you know what I am talking about when I say Ginger Beef, this is a homegrown Western Chinese classic, born in “cowtown” Alberta, this dish can be really hard to find all over the place. I don’t think I have actually eaten ginger beef since I was about 16, but tonight I made a killer super authentic ginger beef, that blew my family away, and my guy is a total ginger beef connoisseur, he claimed it was the best ever, and I totally agree! I made it gluten free and of course the beef was grass raised grass finished happy healthy beef, I also made mine super heavy on the garden veg. Now straight up this is not a easy dish to bang out in a pinch, it took hours of marinating and a double fry, with a wok stir fry finish. Lots of steps, but if your miles away from a decent Chinese meal and your family is aching for a fix, this is the answer. Pair this with my vegan hot and sour soup, and a batch of mu shu pork noodles and you are off to the races… just need some fortune cookies to finish the night off.